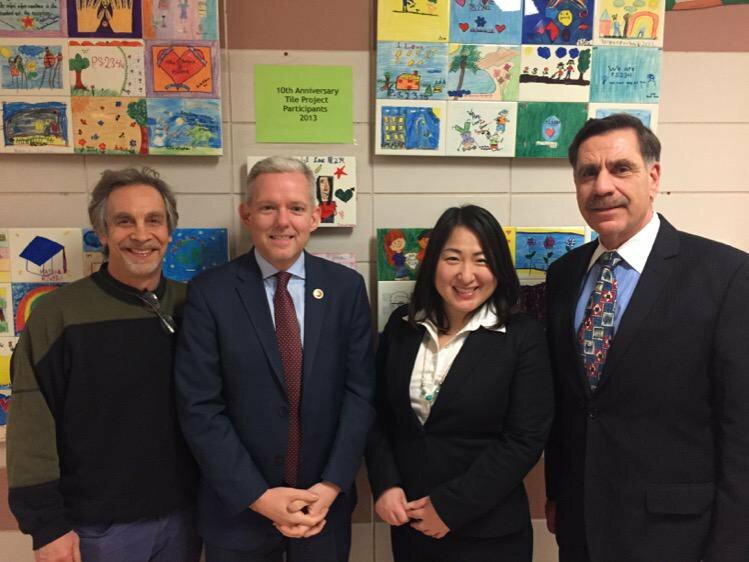 The mission of P.S.361Q, The Woodside Community School, is to provide rigorous instruction that supports each individual child’s strengths, interests, and needs. Our school recognizes the unique gifts that each child brings to the community and utilizes these talents to motivate children to become life-long learners. We encourage our children to explore their curiosities, ask questions, work through real-life challenges, and collaborate with others to solve problems. Through our work together at P.S. 361 Q, children will think critically, demonstrate effective problem solving skills, and communicate powerfully and compellingly with a wide-range of audiences. As a school community, we celebrate the unique gift in each child and support each child to become successful: academically, socially and emotionally in an environment of trust, safety and academic rigor that will prepare them for an ever changing global society. P.S. 361Q is a new public elementary school in Woodside, Queens. We are excited to be a part of this dynamic, diverse community and are committed to providing a rigorous instruction, individualized for all our children in close partnership with our families and community. In our first year in 2015-16, we opened our doors with our young, "budding" scholars in PK and K. We will the be growing each year with our students until we reach 5th grade. When we are fully grown, we will be serving approximately 500 young scholars from PK-5 residing in the Woodside community. We are currently serving PK, K, G1, G2, and G3 students! We will add G4 in 2019-2020 and G5 in 2020-2021! I am the proud founding Principal of The Woodside Community School, P.S. 361 Q in Woodside, Queens. In September of 2015. In our first year in 2015-16, we opened our doors with our young, "budding" scholars in PK and K. We will be growing each year with our students until we reach 5th grade. When we are fully grown, we will be serving approximately 500 young scholars from PK-5 residing in the Woodside community. The mission of P.S.361Q The Woodside Community School is to provide rigorous instruction that supports each individual child’s strengths, interests, and needs. Our school recognizes the unique gifts that each child brings to the community and utilizes these talents to motivate children to become life-long learners. We encourage our children to explore their curiosities, ask questions, work through real-life challenges, and collaborate with others to solve problems. We believe that through our work together, children will think critically, demonstrate effective problem solving skills, and communicate powerfully and compellingly with a wide-range of audiences. As a school community, we celebrate the unique gift in each child and support each child to become successful: academically, socially and emotionally in an environment of trust, safety and academic rigor that will prepare them for an ever changing global society. Click on the links below to learn more about the good news in District 30 from our Superintendent, Dr. P. Composto! We are now on Twitter! Follow us for more information and updates on what is happening at The Woodside Community School!